This is a stressful time of the year. Some of the stress is good stress; children’s programs at church, parties, presents, all kinds of cookies, and family dinners. Some of the stress is not so good; unreal expectations, emotional strain, expense, time pressures, and family dinners. Humans like routines as much as horses, but now- our usual routines are uprooted. We are torn between barn time and holiday obligations. The pressure of the outside world puts a false speed on every moment and life feels like a total runaway. Yet it’s our daily routines and rituals are truly what keep us up-right and sane. As we have less time and more demands- our healthy routines are usually the first to go, taking along our patience and humor. Dressage has an exercise called a half-halt. Its purpose is to improve the horse’s balance and attention. In the best application, it is a near zen-like experience. Maybe a human half-halt would help- just a pause to catch your balance. Go back the basics; get yourself relaxed and forward. Ground work is a good start; you could walk in a circle until your rhythm and bend returns. Depending on your age- you might need to trot or canter yourself first, before you can get a good walk. I bet what works best for your horse helps you, too. If you are really busy, skip the barn trip. Christmas isn’t really their kind of holiday. Horses will wear that stupid Santa hat to please you, but their heart isn’t in it. If you do get to the barn, this isn’t the time to work on cleaning up that canter depart or begin half pass work. 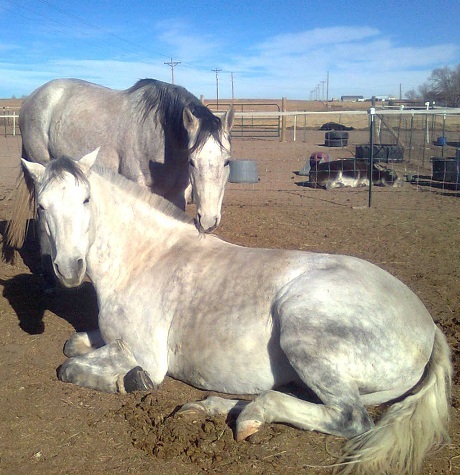 Horses generally think the holidays are a good time for a rider to take up equine massage. However you feel about the holidays- they are here, with all the usual blessings and challenges. And like every other day, you are a rider. You can half-halt, and then take the season at your own pace. ← When I Die, Can I Come Back as Your Horse? Incredible message! Thank you Anna for always helping us remember what is good and right and necessary…from another perspective!